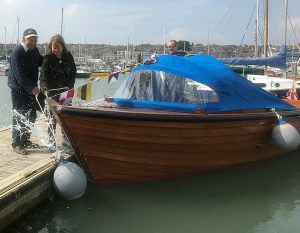 Holly, the latest creation of Anthony Mansbridge Cowes Classic Boat Builder was launched officially today at East Cowes Sailing Club. A bottle of Champagne was smashed over the bow roller by Anthony’s daughter Lisa as she christened the boat. Lisa is pictured along with her dad and crew Phil; just out of shot is Anthony’s wife Kate. Later, Anthony paid tribute to his fellow East Cowes Sailing Club member Eddie Richards who spent innumerable hours helping with the build. David, Vice Commodore, remarked: “Everyone who sees Holly is blown away by her quality and craftsmanship.”.